Dr. Barnes Warnock McCormick, Jr. was a Professor Emeritus at The Pennsylvania State University. Dr. McCormick’s impact on academia, industry and government spanned nearly 60 years, and his teaching inspired and guided the careers of countless engineers at work today in the global vertical flight technical community. After receiving his doctorate in aeronautical engineering in 1954 from Penn State, which was then known as The Pennsylvania State College, McCormick joined the Penn State Department of Aeronautical Engineering as an associate professor of engineering research. However, wanting to gain industry experience, he left Penn State in 1955 to join the Piasecki Helicopter Corporation (renamed Vertol Corporation in 1956) as chief of aerodynamics. Dr. McCormick rejoined academia in 1957 as department head of the University of Wichita (now Wichita State University). Following a brief stint there, McCormick returned to Penn State in 1959 in a joint appointment as professor of aeronautical engineering and a member of the Ordnance Research Lab (now the Applied Research Lab). In 1969, he was appointed head of aerospace engineering, holding the position for 16 years until he resigned to accept a distinguished professorship as Boeing Professor of Aerospace Engineering. In 1990, Dr. McCormick officially retired from Penn State and was named Boeing Professor Emeritus, although he continued to teach on a regular basis for the next 22 years. McCormick also remained professionally active as a consultant to legal firms, as well as industrial and government organizations. He participated in approximately 60 litigations involving aircraft accidents, offering expert testimony in the first accident ruled to be caused by wake turbulence. Dr. McCormick’s research areas of interest included low-speed aerodynamics, flight mechanics, aerodynamics of vertical flight, propeller design, hydrodynamics, noise and the behavior of vortex systems, including their interaction with aircraft and lifting surfaces. In the mid-1960s, Dr. McCormick and his research team made the first measurements of the details of wake turbulence behind a full-scale airplane. A historical marker dedicated to Dr. McCormick and his team, commemorating this pioneering aeronautical research project, is located behind Hammond Building on the University Park campus. Dr. McCormick also authored and coauthored several books, including Aerodynamics of V/STOL Flight; Aerodynamics, Aeronautics, and Flight Mechanics; Aerospace Engineering Education During the First Century of Flight; and Aircraft Accident Reconstruction and Litigation. In 1967, Dr. McCormick developed a short course at Penn State relating to helicopters and VTOL titled "Aerodynamics of V/STOL Flight," which later turned into the Comprehensive Short Course in Rotary Wing Technology. The course, supported by AHS, is one of the longest-running short courses in the history of the University, and Dr. McCormick served as a lecturer and coordinator until 2013. It is estimated that he taught more than 700 participants in the course. The AHS International Alexander A. Nikolsky Lectureship (2004), given to an individual who has a highly distinguished career in vertical flight aircraft research and development. His lecture titled Hurricanes, Tornadoes, Wake Turbulence and BVI — Vortices Come in All Sizes. His professional service was extensive. Dr. McCormick was the editor in chief of the Journal of the American Helicopter Society (1970-1972) and associate editor of the AIAA Journal of Aircraft (1978-1982). He also served on the Congressional Advisory Committee for Aeronautics (1984-1987), was a charter member of the American Society of Aerospace Education, was past chairman of AHS’s Education Committee, served on NATO's Advisory Group for Aerospace Research and Development (AGARD) Flight Mechanics Panel, and served on the Accreditation Board for Engineering Technology (ABET) Board of Directors (1982-1984). 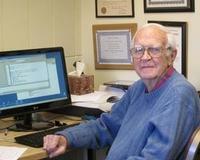 In 2001, the McCormick Honorary Alumni Lectureship Award was established to honor Dr. Barnes McCormick. The lectureship is presented twice annually by a graduate of the department who has performed notably and distinguished himself or herself technically in aeronautics or astronautics. Dr. Barnes Warnock McCormick, Jr. passed away on October 29, 2017, at the age of 91 years. The Vertical Flight Society is accepting contributions to the Vertical Flight Foundation (VFF) towards the Barnes McCormick Memorial Scholarship. Please go to www.vtol.org/donate to make a donation in memory of Dr. McCormick.